Yes,I am one of those techies/geeks that likes to be able to control everything with one remote. I purchased a Harmony One remote for this sole purpose. However after setting up my PS3, Windows7 HTPC, HDTV, and a few other devices; I started to run into problems with the Touchscreen commands starting to repeat onto later screens for that particular activity. This recipe will explain how to fix this problem. It appears to be a general bug in the Logitech software. Basically the problem is this; if you assign an button/command to a hard button for an activity (ie the actual physical buttons on the remote such as Vol + or Vol – and then use the same command again for Additional Commands (to show up on the lcd), the command will repeat itself twice on the lcd/touchscreen area. yet, i only have one page of additional buttons?? 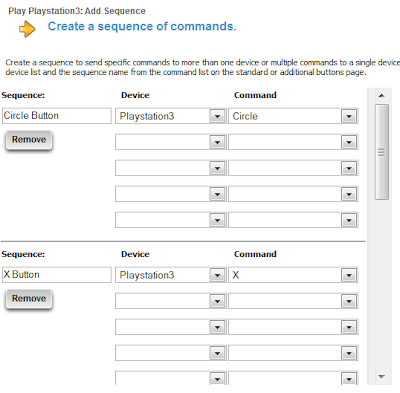 Create a one button sequence for the command you want to use both as a hard key and Additional command/button. 2. Click on the Customize buttons for the activity we are having problems with. 3. In the lower left, click on the “Add Sequence” button. 5. Click the Add button to add another, once your done, hit the Done button. 6. We will be brought back to our Customize buttons screen. Click on the “Standard Buttons” tab to assign the sequence for the hard key we want the command for. (Prev in my example). 7. 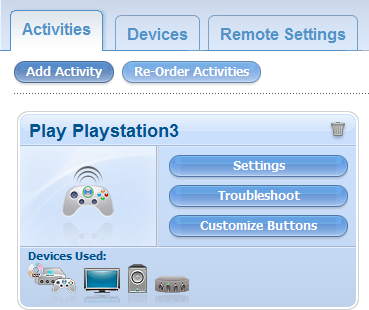 Finally, we can now click on the Additional buttons tab and actually use the real command (in our example Playstation3 > Circle) and once we Update our remote, we won’t have a duplicate icon/button on the touchscreen/lcd!! you will need to do this for any button that you want to use both on the Standard buttons (hard keys) and the Additional buttons (lcd/touchscreen). Props to logitech forums and WannabeActuary for the help on this!